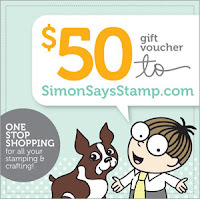 Simon Says Stamp and Show: Simon Says Stamp and Show ... a Tag! 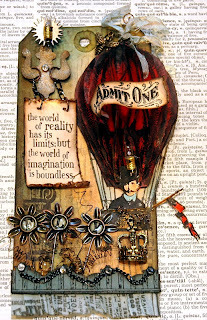 Tracy is paying homage to the fabulous new Charles & Amelia plate from Artistic Outpost to create an adventurous tag cut using the tag and bookplate die. Add into the mix plenty of Nostalgic Tissue Tape for interest in the background and plenty of metal in the form of Philosophy Tag and Screw Brads . 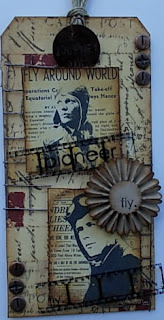 It's up, up and away this week with Candy's dimensional hot air balloon tag featuring Tim Holtz' new Remnants stamp set. Her background is done with Wild Honey and Vintage Photo Distress Stains with a touch of Broken China and Black Soot Distress Inks. Ideaology Foliage and Memo Pins create a lovely "FLY" flower garden below. A lot of changes in life are on the way for Sarah and although she's not taken the plunge into Art Journalling she expressed her moods in a triptych of tags. 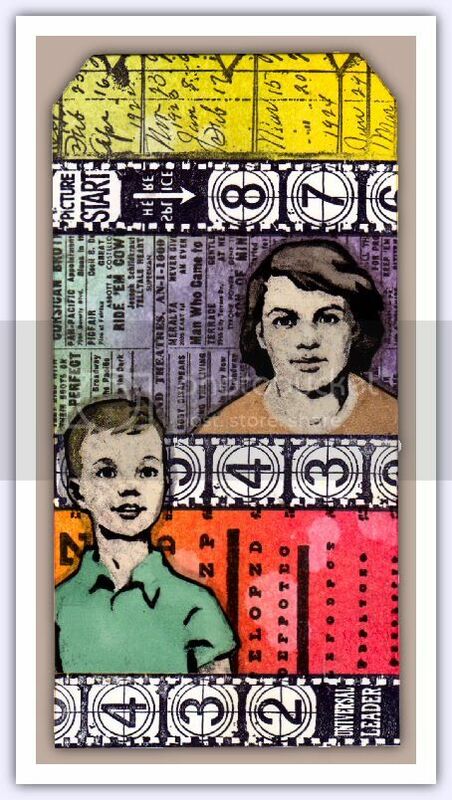 Distress Stains, Distress Inks, a Signo Gel Pen and her favourite Wendy Vecchi stamps were her artistic tools. 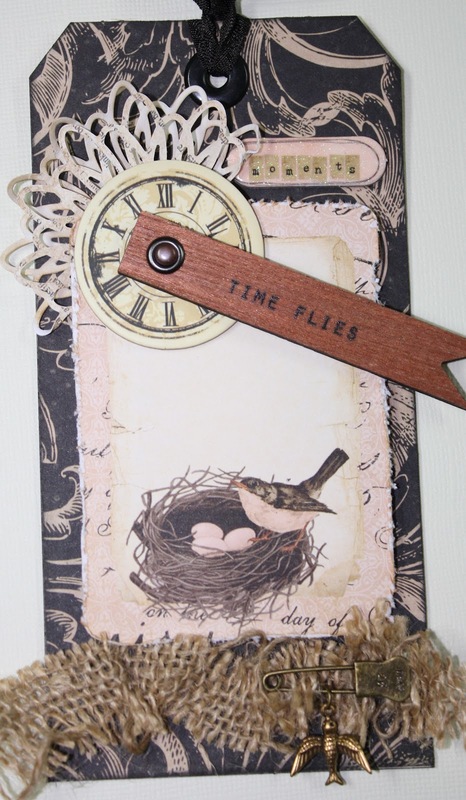 Nancy is completely enamored with Prima's newest lines so she turned to Prima's Almanac paper stack and covered the tag before adding a bird ATC image from the same papers. A Prima wood ticket was added as well as a Prima clock face. Using a piece of Canvas Corp burlap, Nancy gathered the burlap creating a border at the bottom of the tag. Spring is in the air....actually might be more like summer but whatever it is....Lynne is LOVIN' IT!! 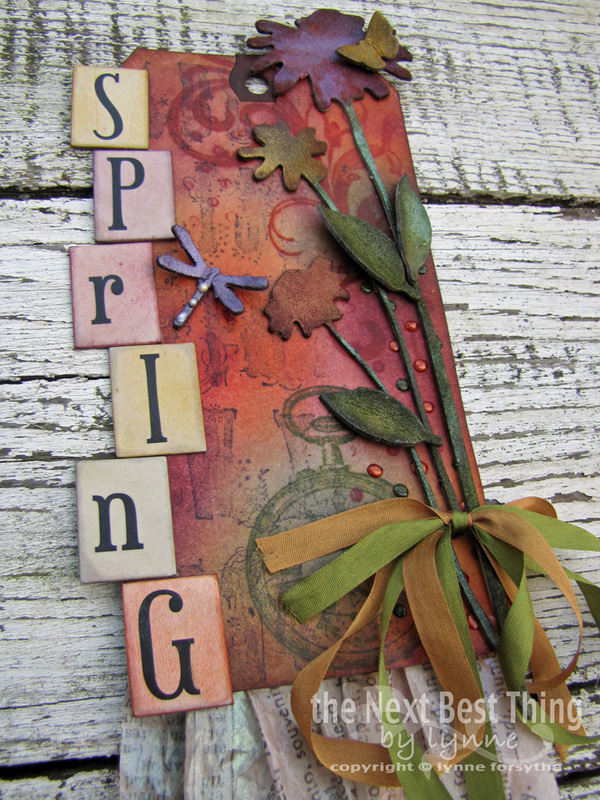 and it inspired her to create a "SPRING" tag!! She used LOTS on Distress Inks, Distress Stains and Perfect Pearls then pulled out her Melting Pot and Beeswax and COVERED EVERYTHING with wax....ohhhh the fun!! 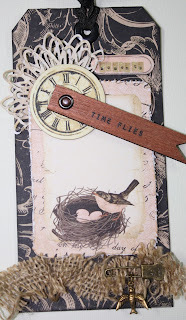 Terry created a set of Party Tags for her daughter's birthday! She used the Tim Holtz Papillon stamp set combined with The Wendy Vecchi Just Flutterby Butterfly. Terry used lots of Rock Candy Crackle Paint and Crackle Accents on top to finish off these fun tags. Dan used Promarkers to colour the 2 photocopied images he used as the focus on his tag. The stamps he used were from the At The Movies and Oddities stamp sets. After stamping the film strips, he masked them off and coloured the panels with Distress Inks and stamped over them, finally adding some water drops before fixing the two figures in place. Ellen used color wash sprays to create a blended background, and then added stamps with paint dabbers and archival inks, a new sentiment stamp from Tim Holtz, some grapevine hearts and an idea-ology key, finishing off the edges with some zigzag stitching. Using a Ranger Size 5 Manilla Tag as a guide I made a chain of tags out of White Card. I used Wild Honey Distress Stain and Dylusions Sprays to colour the background stamping some Tim Holtz background stamps in Vermillion. I then set about filling the tags with Dylusion Stamped images and doodles. I used my ProMarkers to colour the images in. The prize will go to a random entry chosen by Random Generator. The challenge will close at Midnight Eastern time on Sunday, 1st April 2012 and the winner will be announced during the following week. To qualify all you need to do is create a new piece of work ... post it on your blog ... with a link to this site and then pop a link below so everyone can come see what you made! Wow!! What an amazing set of tags you all made. They are stunning. Wow. These tags are all stunning!!! I'm so glad I don't have to choose a favorite! Great theme this week, really helps those Creative Chemistry participants practise their techniques! WOW!!! Such awesome inspiration from the DT!!!! Gorgeous set of tags DT so much inspiration. 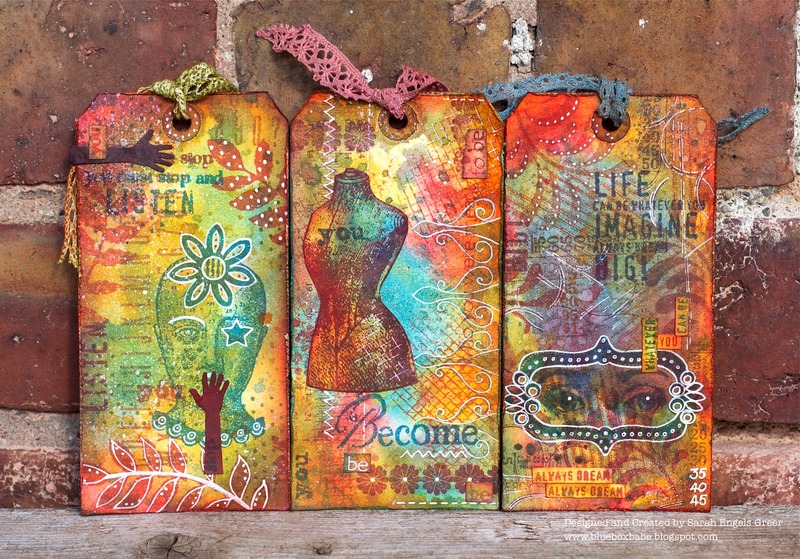 LOVE the DT's tags....so beautiful and inspiring!!! Great challenge! It's my first time here on this blog. I'm very impressed by the tags of the team !!!!! Such an inspiration !! I linked my own tag a few minutes ago. Thanks for another lovely challenge. Great DT inspiration!